Hello and welcome to The Ton’s Fall 2017 Release Blog Hop! It’s Jenny here, and if you just came from Justine Hovey‘s page, you are at the right place! New products including the coordinating dies are available now! Hope you’ve been enjoying the Fall 2017 Release new product reveals and inspirations from our team. I am so in love with all the new products and it was very difficult to pick which set to play with for today’s project. After giving it a good thought, I went with our new Cozy Poinsettia Stamp set and created 2 cards in different vairations. To start off, I stamped the Cozy Poinsettia on 2 corners of a watercolor cardstock in Versamark ink and heat embossed in gold. I stamped the 2nd set on a black cardstock for the next project. I let it dry completely and splattered some gold ink all over the panel. I trimmed the panel down to 4″x5.25″ and went ahead and rounded 2 corners with the Corner Chomper. Then, I stamped the sentiment on vellum in Versamark ink and heat embossed in gold. I trimmed it down to a banner, wrapped it around and secured it on the back with a piece of tape. Next, I adhered our Glossy Fine Gold Glitter Adhesive paper on a white A2 card base to add golden border around the card. I adhered white fun foam on the back of the main panel and popped it up on the card. I adhered some Medallion Gold sequins to finish the card. I went with gold&black for the 2nd card! I stamped the Cozy Poinsettia image exactly the same way as the 1st card, on a sturdy black cardstock. I colored the image with with Gansai Tambi Starry Night watercolors. I blended the colors out with clear clean water using water brushes. I am pleased how gorgeous these watercolors are. I let the panel dry completely and trimmed it down to 4″x5.5″. Next, I made a sentiment banner, stamped in Versamark and heat embossed in gold. I adhered it across the banner and adhered the ends on the back. I decorated the edges with Glossy Fine Gold Glitter Adhesive paper. Then, I decorated the side edges of a black A2 cardstock with our Yellow Gold Burnished Foil Tape and popped up the main panel with black fun foam. I added some Medallion Gold sequins and the card was complete! Jenny Lee Yamasaki <———- You are here! Anna Kutsenko<—————— Your next stop! 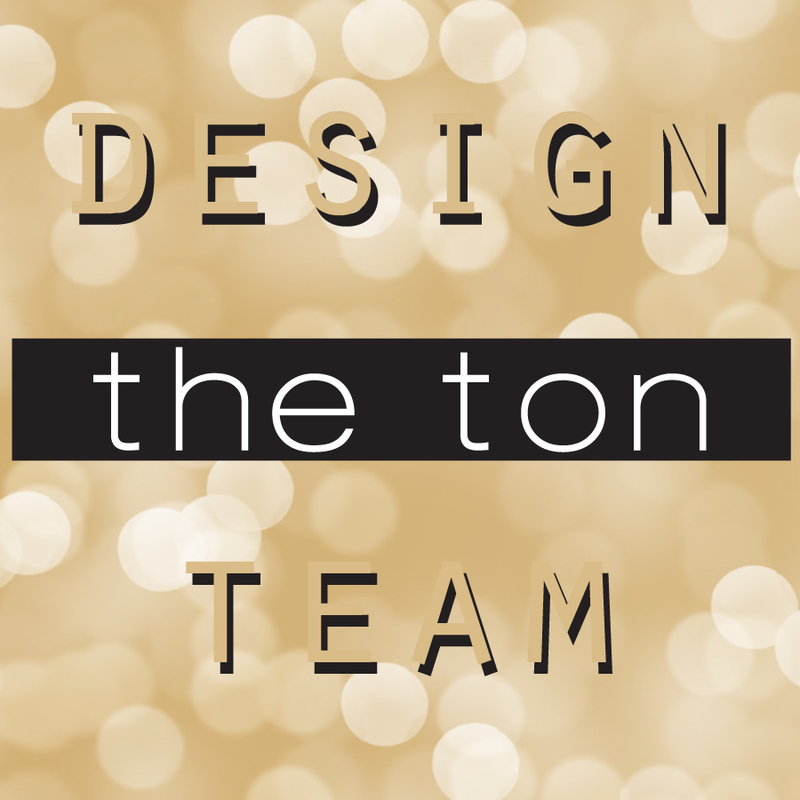 The Ton’s September Challenge is now live! For this month, we have a fun Mood Board Challenge so head over there now for a chance to win a $50 spree to The Ton’s shop! Hope you enjoyed the cards, and thank you so much for stopping by! Your next stop is fabulous Anna Kutsenko‘s Blog! Wow. Both of your cards are absolutely gorgeous. Gorgeousness!!!!!!!!!! Your eye for design is incrediable! Love these gorgeous designs Jenny!! Swoon by the elegance of them! Thanks for the inspiration Have a wonderful day! Oh, the gold and black is just amazeballs gorgeous!! Your cards are so elegant. Both of your poinsettia cards are so beautiful! I especially love the red and green one, but the gold one is so elegant looking. They are both wonderful! Absolutely gorgeous cards! Love the rich coloring on the first card and the very elegant effect of the gold embossing on the dark background on your second card! Wow, beautiful cards! The gold embossing is amazing. I always look forward to your amazing cards, and here you do not dissappoint. Simply gorgeous poinsettias! Lovely card. Just lovely! Great inspiration. The gold makes them so elegant. The black and gold one is so striking! Both your cards are gorgeous Jenny! I would never have thought to use the poinsettias on a black background so thank you for the inspiration! Beautiful really loving the big poinsettia stamp I need a big floral stamp to color!